After spending a day listening to great music at Coachella, attendees witnessed a mid-century, Palm Springs mansion complete with a pool (yes, a pool! ), dance floor and hundreds of guests. But was it real? It was actually “Mirage,” the highly praised 3D projection experience created specifically for Coachella by Pearl Media Productions in collaboration with artist Paul Clemente. A swimming pool at Coachella? Not quite. It’s part of an art installation, “Mirage,” that debuted tonight. Most people entering earlier today probably noticed a big, white, house-looking building. A lot of people were taking shelter under its shade. But when the sun went down, the cool stuff started. At 40 feet tall, 80 feet wide and 100 feet long, it’s designed to look like a Mid-Century Modern Palm Springs mansion, according to Pearl Media Productions, which created it. There are spotlights on several of the outside walls, which people are using to take shadow portraits of themselves. 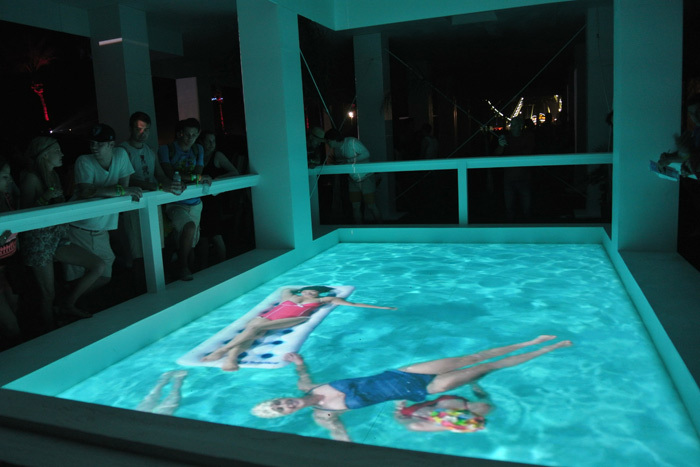 But the coolest part is a structure that looks like a swimming pool, with video of women floating and swimming around being projected down. It’s sorta trippy. And people are having a hard time resisting jumping in, though they’re quickly getting shoed away by the staff. It ran five hours a night every night of both festival weekends. For more video coverage Click Here.